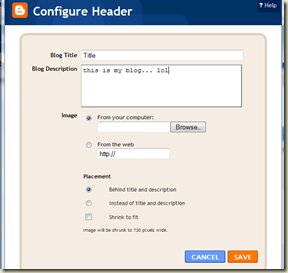 How to Configure a New Header In Blogger! 1.Before you get started you want to create your header in a program such as “Paint” (that is what I used). 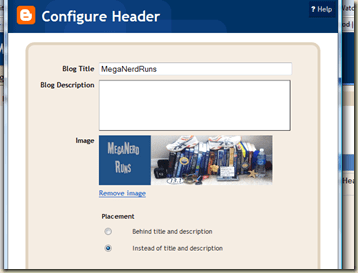 Make sure that is about the same size as your current header… in my case long horizontally and short vertically.If not it will look weird and might mess up the look of your page altogether. Save the file and remember the name of the file. Note: To change the size of the image in Paint, you cannot simply zoom in and out. 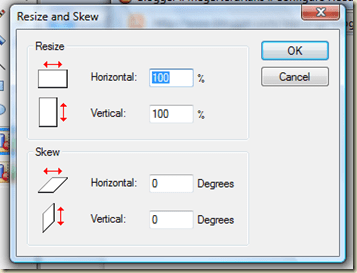 You must go to Image: Resize/Skew. To make it longer horizontally, make the Horizontal number bigger (like 150% or something) and just play around with it until you figure out the sizing you want. 4. A little box like this one should come up. (or something similar) Hit “Browse” and find the file you want to make your header, and select that. You then choose the placement. I did mine “instead of the title and description” but you can do whatever you prefer. If your header image is not the size that you need, make sure you hit “shrink to fit’”( I didn’t have to do this because I made sure that my file was the right size). Then, hit “save”. 5. Check to make sure that it saved and that should be it! Hopefully this wasn’t too confusing and at least sort of helpful. Let me know if you have any more questions about it!